1. Which bank first introduced ATM in India in 1987? 2. Which bank first introduced Credit Card in India? 5. What is the full form of ATM? 6. Which cards may not linked with bank accounts? 8. What is the maximum amount that can be used in Open-System Prepaid Cards? 11. NBFCs are registered under which Act? 12. Which type of ATMs can be provided by NBFCs? v. Agency Functions - like Remittances (fund transfer), Collection and payment of various items, Purchase and Sale of Foreign exchange, Purchase and sale of Securities, Income Tax consultancy, Trustee and Executor, Letter of reference, etc. vi. General Utility Functions - Locker facility, Travellers' Cheques, Letter of Credit, Underwriting Securities, Collection of Statistics, etc. Which of the above is/are Secondary Function of Banks? 15. Initially who provides Bill of Lading to whom? Note - Do not refer any source while answering the questions. You can comment in the Comment Section below. Your active participation is needed! 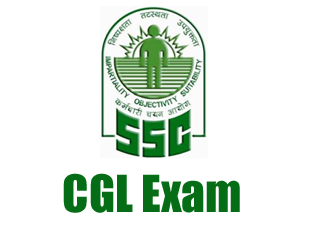 SSC has released the answer key of Tier-II of CGL 2014 exam. However many candidates notified that answer key of Maths section has many error. Hope SSC will come out with corrected answer key in due time. Please send your feedback regarding Bankoncepts Study Plan 2015-16. Let us know whether you liked it or not. Also, tell us about the improvements needed, so that we can help you to our best! If you like Bankoncepts, please invite your friends and help grow your audience! Thank you! 2. Which loans are referred as Clean loans/advances? ii. There is no need for any separate account for availing Overdraft facility. 5. If the Bill of Exchange is not honored on the due date, there is always a change the drawer will become liable on the bill. This is called a Contingent Liability. What does it mean? 6. What is the time period to mark a loan asset as non-performing? 8. What is the full form of SARFAESI Act? 10. What is the notice period to seize secured assets by SARFAESI Act? 11. Which of the following is/are Asset Reconstruction Companies (ARC)? c. Phoenix ARC Pvt. Ltd.
12. Which of the following is not a sector for Priority Sector Lending (PSL)? 13. Which one is the Priority Sector Lending target percentage? 14. Which one is the sub-target of PSL for Agricultural activities? 15. Loans against deposits is which type of loan security? 17. Which is the minimum chargeable interest for the credit sanctioned to the borrower by a bank? i. Family income ceiling per annum in rural and urban area should be less than Rs. 18,000 and Rs. 25,000 respectively. iii. Banks are required to lend 1 % of their total outstanding advances under DRI Scheme every year. 1. Which account is best suitable for fixed monthly savings to earn maximum interest, for an individual? 2. What is the full form of CASA? * Sorry, there was a mistake in highlighting. It will be Current and Savings Account. 5. Which of the following is false? 6. Which of the following is false? 7. What is the full form of BSBDA? 8. Which of the following is true regarding BSBDA? 10. Which of the following is true regarding BSBDA? 11. Which of the following is true regarding Small Accounts? 12. Which of the following is true regarding Small Accounts? 13. What is the full form of DICGC? 14. DICGC insures which of the following bank accounts? 15. Which is true regarding banks insured under DICGC? i. Commercial banks - Public sector banks, Private sector banks, Foreign banks operating in India, Regional Rural Banks, etc. 16. Which deposits are not covered under DICGC? 17. What is the maximum amount / limit to be claimed under Deposit Insurance scheme of DICGC? 20. What is the slogan of PMJDY? Note - Do not refer any source while answering the questions. 1. Which of the following Cooperative banks work in district level? 3. Anonya Cooperative Bank Ltd. (ACBL) is the first Cooperative Bank in India. Where is it located? 4. The government is to set up Postal Bank of India in near future. What is the proposed structure of this bank? 5. MUDRA Bank will regulate and refinance all Micro-Finance Institutions (MFIs) in India. What is the full form of 'MUDRA'? 6. What amount of corpus is allocated to set up MUDRA Bank? 7. What percentage of Priority Sector Lending (PSL) is being created for Micro Enterprises? 8. MUDRA bank will refinance and regulate which institutions? 9. What amount is allocated for Credit Guarantee Corpus of MUDRA Bank? 10. MUDRA Bank will be created under which yojana of government? 11. What is the total minimum paid-up capital of Small Banks and Payment Banks? What is the minimum paid-up capital of Small Banks and Payment Banks? 12. Which of the following banks cannot take time deposits from public? 13. Which bank is mainly created for providing remittance / payment services? 14. Payment Banks can issue which type of Cards? 15. What is the main purpose to set up Small Banks? a. Providing credit to small farmers, small business, unorganized sectors, etc. 16. Payment banks can accept demand deposits, but initially with a maximum limit. What is that limit? 18. Which bank is created for the promotion of cross border trade and investment? 20. National Housing Bank (NHB), a subsidiary of RBI, regulates and refinances social housing programs in India. Where is the headquarter of NHB? 21. What is the full form of NABARD? 22. NABARD was formed on the recommendation of Committee to Review Arrangements for Institutional Credit for Agriculture and Rural Development (CRAFICARD), set up by RBI. Who chaired the committee? List of Public Sector Banks (PSBs) - CMDs, H/Qs, taglines, etc. List of Private Sector Banks - CMDs, H/Qs, taglines, etc. 1. RBI was established (April 1, 1935) under which Act? 2. Who was the first Indian governor of RBI? 3. In which year RBI was nationalized? 4. Who among the following is not incumbent (as of April 14, 2015) Deputy Governor of RBI? 5. RBI recently proposed a new post in the rank of Deputy Governor (along with the 4 Deputy Governors). Which one is that post? 6. Which one of the following rates is not decided by RBI? 7. Which of the following bank is generally not considered as Commercial bank? 11. Which of the following banks is not nationalized in 1969? 13. Which of the following is not considered as Nationalized Bank? 15. Who is the chairman of United Bank of India (UBI)? 18. Who is the chairman of Bandhan Bank? 19. Where is the headquarter of Federal Bank? 20. Which private sector bank was earlier known as UTI Bank? 2. Which was the first foreign bank to open a branch in India? 3. Which is the oldest bank in India? 5. In which years RBI and SBI are nationalized respectively? 6. Which bank was merged with Punjab National Bank in 1993? 7. Allahabad Bank (est. 1865) is the still functioning oldest Joint Stock bank of India. Which bank is the first Joint Stock bank of India? 8. Which bank sponsored first Regional Rural Bank (RRB) in India by the name Prathama Grameen Bank? 9. Which bank is the first Cooperative Bank of India (also in Asia)? 10. Which bank was renamed on 30th April, 1955 to become State Bank of India? 11. Which is the first bank that was purely managed by Indians? 12. Which commercial bank was first wholly owned and managed by Indians? 13. How many banks were nationalized in 1969 (Smt. Indira Gandhi regime)? 14. In which year 6 banks were nationalized (Smt. Indira Gandhi regime)? 15. Who is the first Governor of RBI? 17. Which is not an Associate Bank of SBI? 18. Which is an old private sector bank of India? 19. Which private sector bank is recently merged with Kotak Mahindra Bank (KMB)? 20. Which combination has female CMDs? 21. Which two private sector banks have got license from RBI in 2014? 22. Who is conferred with the Best Central Bank Governor Award for 2014, by Euromoney? 24. Which bank first introduced Automated Teller Machine (ATM) in India (1987)? 25. Bank of Rajasthan was merged with which private sector bank? This year SBI PO vacancies are increased by 8.87 %. But at the same time, the number of candidates will be much higher than the previous year, which was approximately 20 lakh or more. Obviously it is a hard nut to crack, but dedication, hard work and proper planning will help you achieve your goal! 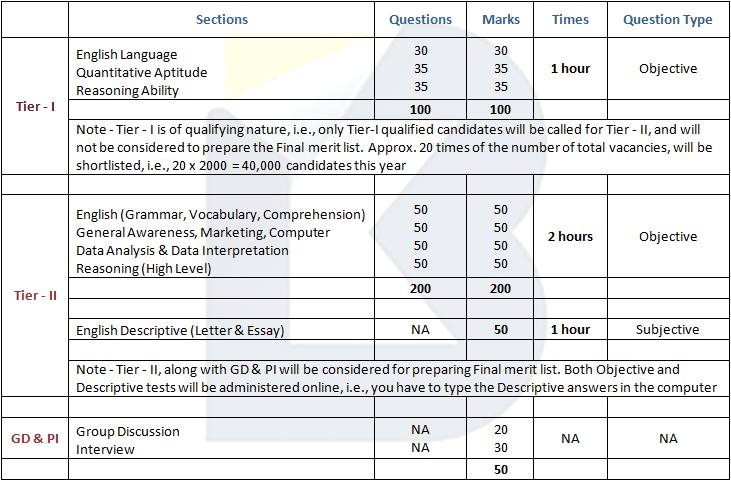 Note that Pattern of Tier-I is the new addition in this year's SBI PO exam, whereas, the pattern of Tier-II and GDPI is same as previous year. You can expect the same pattern to be followed in IBPS PO V exam, except that it may not contain Descriptive paper and Group Discussion. Best of luck to all of you from Bankoncepts! All content provided on this "BanKoncepts" site is for informational purposes only. The owner of this blog makes no representations as to the accuracy or completeness of any information on this site or found by following any link on this site. The owner of "www.bankoncepts.in" will not be liable for any errors or omissions in this information nor for the availability of this information. The owner will not be liable for any losses, injuries, or damages from the display or use of this information. Copyright ©2015 BanKoncepts. All rights reserved. Powered by Blogger.